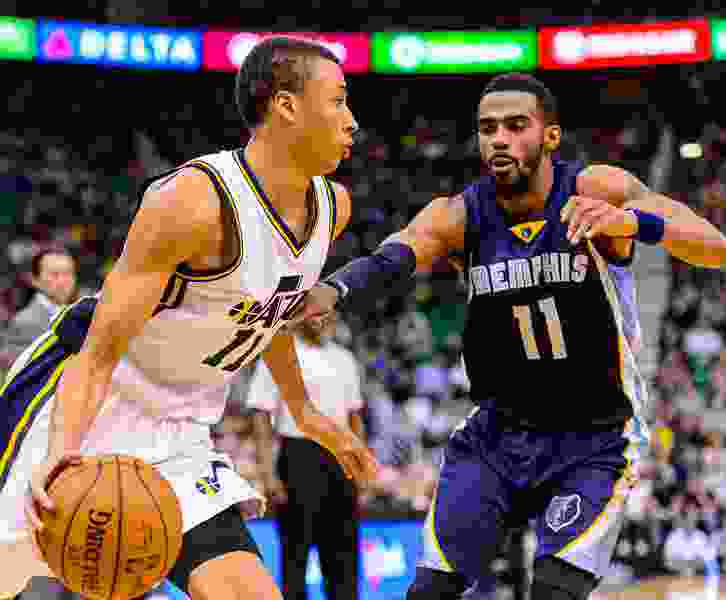 (Trent Nelson | The Salt Lake Tribune) Utah Jazz guard Dante Exum (11) drives on Memphis Grizzlies guard Mike Conley (11) in 2015. Here’s an update on the Jazz’s trade deadline efforts, with that deadline just three days away. Word from nearly everyone I talk to is that the Jazz are being relatively aggressive this trade deadline, trying to get something done to improve the team. The two biggest deadline deals in Jazz general manager Dennis Lindsey’s tenure — Rodney Hood for Jae Crowder and Enes Kanter for a first-round pick — have been about getting something of value for expiring contracts that the team was unsure they’d re-sign. There’s a similar sense on this trade deadline, though the difference is that Hood and Kanter were still on their rookie deals, meaning that their impending free agency was to be restricted, not unrestricted. It’s not so much that they’re shopping Ricky Rubio, Derrick Favors, Thabo Sefolosha and others before the deadline, but they’re relatively willing to move those guys for long-term upgrades at the position. They’re also willing to be aggressive with another asset: their 2019 first-round draft pick. The sense of the Jazz’s scouting department is that this draft is one of the weakest in recent memory beyond Duke’s Zion Williamson and a select few at the top, players who are unlikely to reach the Jazz’s nonlottery position. But the value of picks can rise on draft day, too: If the team doesn’t get something it likes this week, keeping the pick until June also is a reasonable way to use the asset. Even so, this front office does have a deep affection for the players they’ve accumulated and believes the camaraderie and work ethic the team has displayed fit their plans for the Jazz’s culture. It’s just that there’s wide agreement that more talent is needed. The most serious players in the race for Memphis point guard Mike Conley continue to be Utah and Detroit, a source tells The Salt Lake Tribune. Last week, the Jazz made an offer involving Ricky Rubio and the 2019 first-round pick for Conley. Detroit, on the other hand, apparently has made an offer involving Reggie Jackson and a first-round pick. As always, what the exact salary filler is to make up the difference between the contracts is an important point of negotiation. Detroit’s first-round picks are likely to be better than Utah’s moving forward, so that would seem to be more appealing for Memphis. But Jackson’s contract still has another year left: He’s owed $18 million for the 2019-20 season, which Memphis would probably prefer to avoid. Which offer Memphis prefers in totality is unknown. There’s also this: Whichever team then takes its offer to the next level, by adding additional picks or young player assets will probably win Conley outright. If someone does raise the offer, a deal could get done in the next couple of days. If not, Memphis can wait until deadline day itself to let the pressure build. Another wrinkle: Whichever veteran salary ballast Memphis receives in the deal may make more sense on a team that’s not rebuilding for the immediate future. Third-team takers for those players are another factor of complication. The Chicago Sun-Times reported that the Bulls have interest in a veteran point guard like Rubio or Indiana’s Darren Collison, either in a trade this week or as a free-agent acquisition in the offseason. The Jazz would like to acquire a stretch four before the deadline if possible, though the options are limited. They have been interested in Washington forward Otto Porter, but there has been a “gap” in discussions with the Wizards since they asked for a package in return that Utah saw as unreasonable. Those discussions could rekindle before the deadline, but it would take Washington engaging in discussions with Utah for a lesser asking price. The team also sees New Orleans forward Nikola Mirotic as an option before the deadline. No word on the state of those discussions, and, of course, the Pelicans seem to be busy with more pressing matters at the moment. ESPN’s Adrian Wojnarowski reported that Pelicans GM Dell Demps and Lakers President Magic Johnson spoke several times on Monday regarding a deal for Anthony Davis. Memphis' JaMychal Green is a potential fit, too. The Jazz like Green, and he’s shooting 39.6 percent from deep this season. But Green’s inclusion in any Conley deal is made more difficult by his expiring $7.7 million salary, and the Jazz are already having some difficulty making the large amount of incoming salary work in the conceived trade without including Favors, which they’d prefer not to do. A separate trade to acquire Green might make more sense.